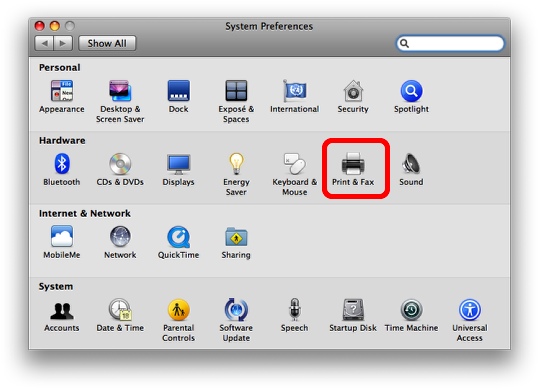 Installing a printer on Mac OS 10.5 (Leopard) in a Windows Environment | Christoph Bartneck, Ph.D. The Department of Industrial Design at the Eindhoven University of Technology is using Windows to administrate all printers and servers. Since I am a Mac user, I need to adapt to this environment. The following instructions will hopefully help you installing and using printers in this environment. We will be using Window’s SMB protocol to connect to a printer server that collects all print jobs in a queue before sending it to the actual printer. 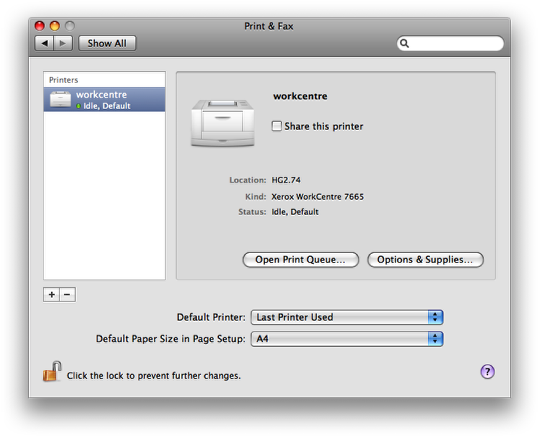 “idworkcentre” – this is the name of the printer. The printer names are on a labels that are glued to each printer. 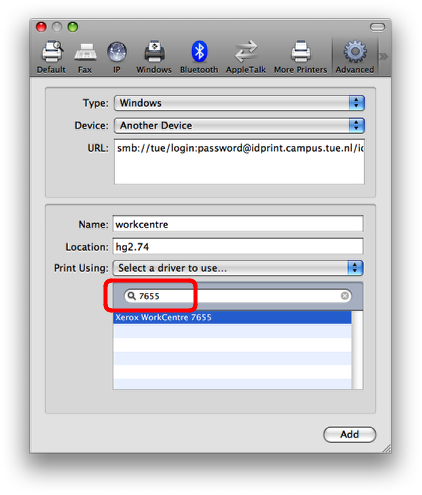 For this tutorial, we are using the “idworkcentre” printer as an example. You need to select a printer driver. 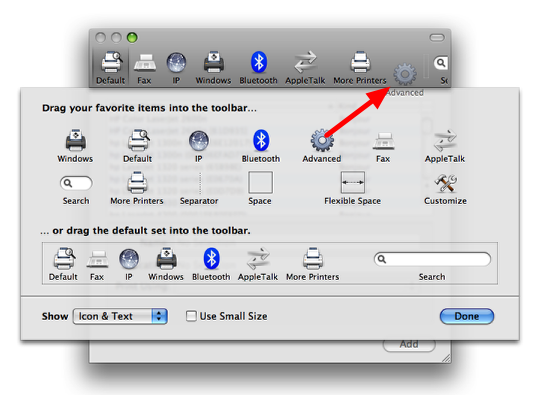 You can narrow down the list of printer drivers by writing parts of its name into the search field. The printer might have options installed. Select the appropiate options. Your printer is now ready for action. A small comment: “login:password” in the url may for security issues be removed, Mac OS will ask for it before printing (and store the info in keychain). 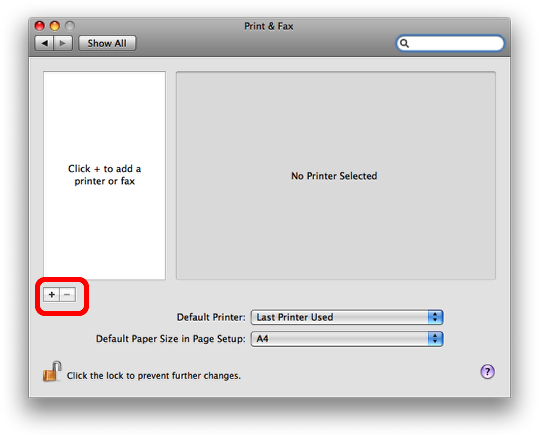 Please consider this when entering the smb address of the printer. I tried to setup the printer without the login/password information in the URL and it only resulted in a printing error. The authentication did not work. I agree that it would be better not to have this information in the URL, but I do not know a way on how to print otherwise. That should allow the document you clicked resume to print. The methods above (using smb://user_id:password@domain/sever_name/printer_name work better IMHO as you don’t have to re-enter your password and domain every time you print. Also remember the printers name is case sensitive. The solution I provided used to work before the server changed. Leaving out the log-in part makes Mac Os ask for login credentials again. 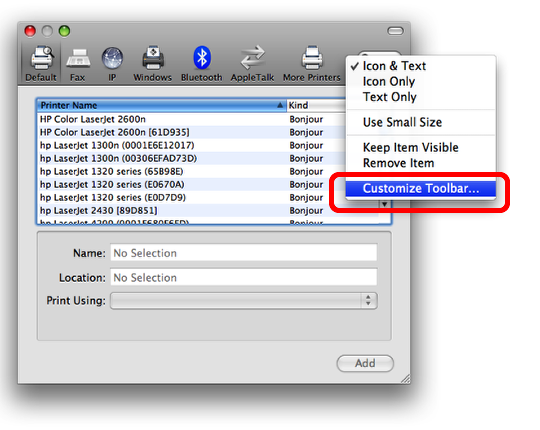 Works fine in Leopard, haven’t had a chance to check with Snow Leopard….. The solution provided in the last comment works for Snow Leopard as well. Im not getting the login screen after adding the printer. Im using Snow Leopard and an ID printer in the 3rd floor. Any idea how to get the screen where to put my credentials? Is there any way to get the credential screen? 2. “tue” DONT DO THIS!! store your login later when it is asked. I used the Generic PostScript Printer driver. but other options might work as well. 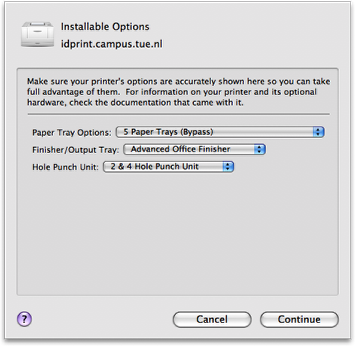 After you are finished with this procedure, all the printers on the university will be automatically found when you try to add a printer in the normal way (system preferences –> print & scan –> + sign) and can be added by merely searching through the list. The good thing is, after you’ve done this once, you won’t have to do it over again. Thanks a bunch everyone, especially for updating with your fixes for OSX 10.7. I had a problem with my campus Ricoh MP C2050 printer, and this has fixed it for me. I had to leave out the username and password credentials to make it work, which means I need to supply them each time I print, but I’m happy now. Does anyone know why the printer keeps switching to paused? I followed above steps and everything seemed fine. Now doing a test print, print shows up in print queue. Printer says its paused, when I resume printer, it start processing and all, but then flips back to paused. I use the generic postscript printer driver. Thanks for helping!